Visit FiveSTAR Landscape and enter to win a free landscape design (up to $500 value)! If you have landscape needs, stop by Booth 870 to speak with our expert staff! Join Us! January 26th and 27th you’ll find everything you need to tackle your home improvement projects, reinvent your outdoor spaces, plan your next Texas adventure and amazing home décor! For all the best deals you have to get down to the Sugar Land Home & Garden Show! For more information visit our show information page! Stop by FiveSTAR Landscape to speak with our experts and get advice, or register for a free landscape design by one of our Texas Licensed Landscape Architects (RLA)! 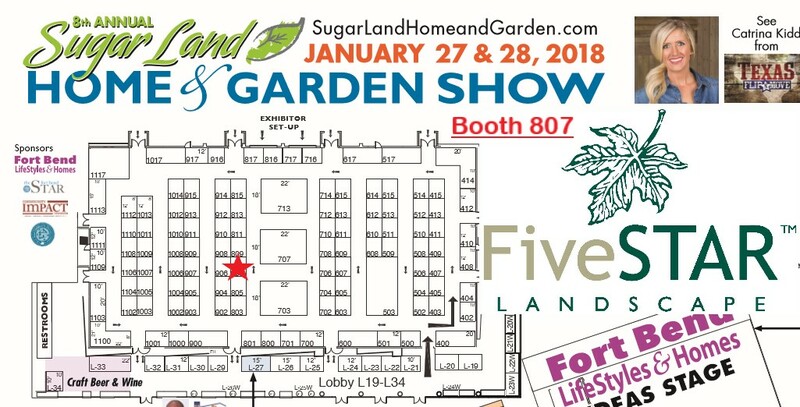 The Sugar Land Home & Garden Show provides home owners a convenient, one-stop shopping experience and the opportunity to find the perfect company for all your home improvement projects and landscape needs. Learn about the newest gadgets designed to make your home life easier and get expert advice from industry professionals to make educated decisions for your home and family. Find inspiration and ideas for your next big project and the experts you need to get the job done at FiveSTAR Landscape!